Haden mangoes are a tricky lot as they are hard to distinguish from the Tommy Atkins variety, discussed next in the series. You’ll understand WHY it’s important to distinguish them when you read about the Tommys. Anyway, Hadens are a pretty decent lot, and most feel they have good flavor. But they have some fiber, which in my opinion, takes them out of the running for a “most favored mango” rating. I’d take them over a Tommy Atkins any day, but easily choose a Kent, Keitt, or Manila mango first. Because of the presence of some fiber, I think the only way one I’d enjoy a Haden is if it were in a *perfect state* of ripeness; it would have to be absolutely at its peak. And to be fair, Hadens have an extra side benefit: they are quite fragrant! Okay, earlier in the post I said it’s important to tell Haden mangoes from Tommy Atkins mangoes. 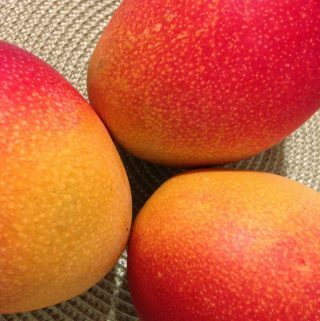 Below are examples of ripe Haden mangoes. And for contrast purposes, the third image shows a basket of Hadens on the left, and a basket of Tommy Atkins on the right. Every computer monitor is a little different, but you should be able to detect that the Hadens are a warmer red, and the Tommys are a darker, cooler red. The ripe Hadens have more yellow as well; the ripe Tommys are dominated by cool red, with only a little yellow. 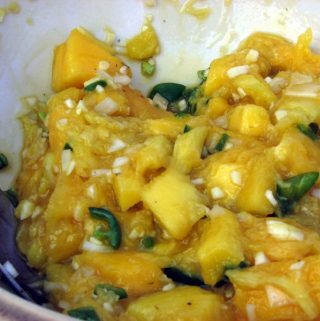 Ripening Cues: Green areas of the mango turn to yellow as it ripens.